If you spend more time hanging from belay lines than waiting in club lines, if a snowy forecast makes you grin ear to ear, if you measure your weekends by bumps and bruises, meet your next favourite piece of gear: the waterproof, freezeproof and shockproof COOLPIX AW110. Built as rugged as you, the COOLPIX AW110 captures your extreme moments as mind-blowing photos, Full HD 1080p videos and ultra-smooth slow motion sequences. With built-in Wi-Fi® for instant sharing, a full-featured GPS with mapping, Points of Interest and Electronic Compass plus all the imaging power of a Nikon, you can finally bring home the rush of going big. The COOLPIX AW110 can handle all that Mother Nature can throw at it. Take it diving to depths of up to 18.0m. Shoot at temperatures as cold as -10° C. And don't sweat drops of up to 2.0m. Whether it's in your hand, mounted to a surfboard, clipped on a backpack or attached to a scuba tank, every twist, splash, dive and crash can be recorded in both still and Full HD 1080p movies. Plus, Nikon's Action Control brings fast and easy operation to gloved hands. The COOLPIX AW110 lets you capture every thrilling moment from inside the action—not the sidelines. The COOLPIX AW110 makes it easier than ever to share beautiful views of your world. Take a great shot and instantly send it to your compatible smartphone, tablet or any Wi-Fi® device. Then use your smart device to email it, text it, or upload it to your favourite social networking or photo album sites—share it the same way you normally share online. Your friends and family will be amazed by the shots you share! Relive the excitement of your travels in a whole new way. The COOLPIX AW110 records the exact location of each shot you take, so you can follow the path of your adventure and every stunning view along the way! Share your journeys on Google Earth™, Google+™, and other social networking sites, or with the included Nikon View NX2 software. Built-in mapping and Electronic compass also help you navigate unfamiliar destinations, and Points of Interest (POI) show you nearby photo-ops like scenic lookouts and historic landmarks. 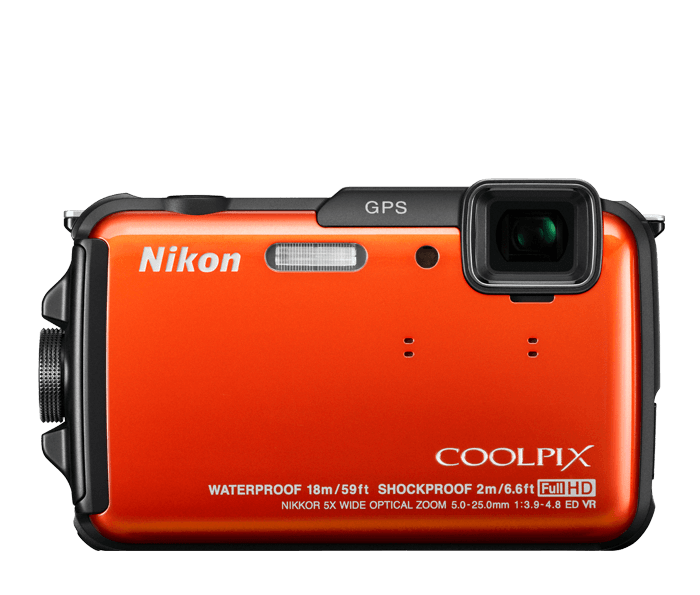 The COOLPIX AW110 is the ultimate travel companion! If you want a compact camera that shoots stunning Full HD videos, the COOLPIX AW110 delivers. 1080p Full HD means exceptional video quality. Record the action, then connect to an HDTV and watch your videos come alive. A built-in mic records high-quality audio in stereo. Your videos will look and sound phenomenal. The COOLPIX AW110's highly sensitive CMOS image sensor performs so well in low-light situations that in most cases, using the flash is optional. Capture the moment without interrupting it. Lens-shift Vibration Reduction helps ensure all of your photos and videos are steady, even if your hands are not. Say goodbye to blurry photos, shaky videos and tripods. Kids and pets are always on the go. Fortunately, the COOLPIX AW110 includes Subject Tracking, which automatically locks onto a moving subject and helps keep it in focus until you're ready to take the shot. Based on Camera and Imaging Products Association (CIPA) standards for measuring the life of camera batteries. Measured at 23(-/+2)°C; zoom adjusted with each shot, flash fired with every other shot, image quality set to Normal, image size set to 4624 x 3464 (16.0MP). Battery life may vary depending on shooting interval and length of time menus and images are displayed. Compliant with MIL-STD 810F Method 516.5-Shock. Dropped from a height of 202 cm onto a surface of 5 cm thick plywood (changes in appearance, such as paint peeling off and deformation of the drop shock portion and waterproof performance are not subject to the test). These tests do not guarantee that the camera will be free from damage or trouble under all conditions.